An individual cardiomyocyte contracts when calcium ions enter the cell. These calcium ions must also be transported out of the cell to prevent calcium overload. Each heartbeat ions enter and exit the cell through ion channels in the cell membrane. This process is put in motion by an electrical signal transmitted from the neighboring cells. In response, the cardiomyocyte depolarizes. In doing so it also makes it's own electrical signal, the action potential. Phase 0 fast sodium channels open and sodium flows into the cell (depolarises). This results in the rapid upstroke. Phase 2, also known as the plateau phase. This phase is characterized by potassium efflux and calcium influx. Phase 3, the potassium efflux exceeds the calcium influx. The membrane potential decreases to 90mV (repolarization). 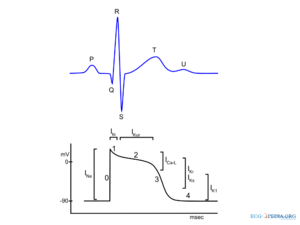 The action potential of a cardiomyocyte has several phases and ion currents. As adjacent cardiomyocytes depolarize, a domino effect is set in motion: the depolarization wave. This depolarization wave is registered on the ECG. This page was last edited on 7 September 2008, at 21:31.